I’d like to start by apologising to anyone that regularly reads my blog for my lack of posts. The summer holidays were a really busy time, and I kind of lost my blogging mojo! However, now I have both children at school (hooray!) I haven’t only got more time to blog, I have more time to do other things too, for the first time in six years! During the summer the house felt very chaotic, toys everywhere, piles of washing waiting to be put away, I felt like I was drowning in housework and only had time to touch the surface of it. Sound familiar? As September arrived, I had BIG plans to get on top of it all. I am a self-confessed messy person. I often get clothes out when deciding on an outfit and fail to put the options that didn’t make the cut away again. I can’t call it laziness, because i’m far from lazy, I think I just have that mentality where I will ‘do it later’. Unfortunately this way of thinking isn’t helping my mental health, because when I feel unorganised physically, my mind is a complete mess too. When this happens, its a huge sign to me that I need to dedicate some time to de-cluttering, because as the saying goes, a tidy house = a tidy mind. Nothing resonates with me more. 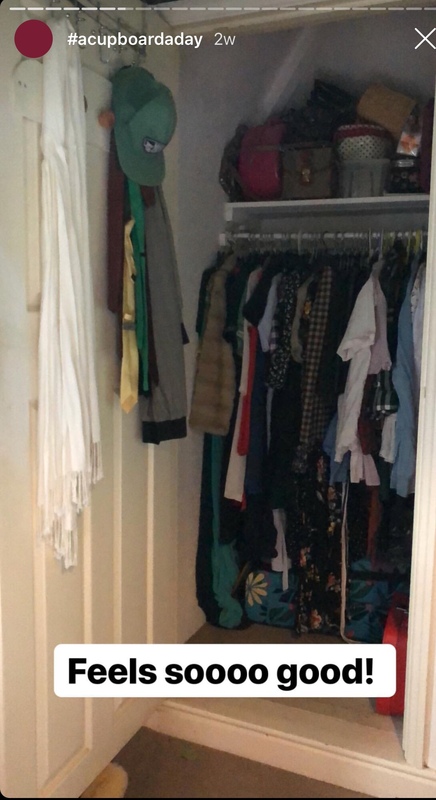 De-cluttering your home can be overwhelming, trust me, i’ve been sat in the middle of a bedroom that has been turned upside down, surrounded in stuff that not only did I not need but stuff I had no idea I still had. 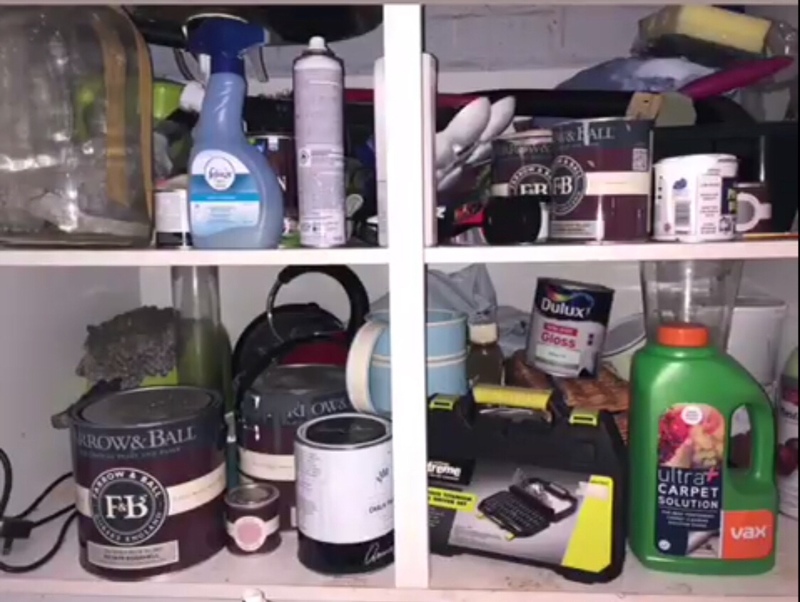 Now I am by no means a de-cluttering expert, but what I can offer is a simple method that has been helping me to get our home in order, gradually and thoroughly one cupboard/drawer/space at a time and my god does it feel good! The great thing about this method which I have been calling #acupboardaday (please feel free to join in on Instagram) is that you don’t need to dedicate a whole day to de-cluttering your house, you simply do it on the go. 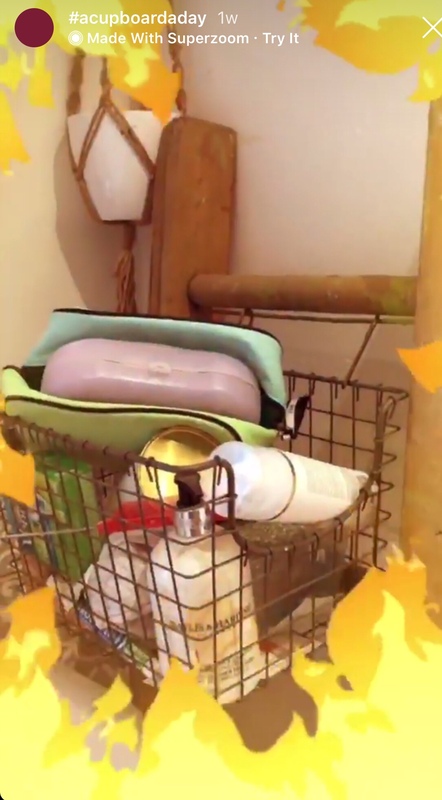 Whilst your children are in the bath, perhaps de-clutter your bathroom cabinet, throw anything that is out of date and if you don’t use it, get rid of it. Once you part with things you don’t use, you will immediately feel lighter, liberated in fact. 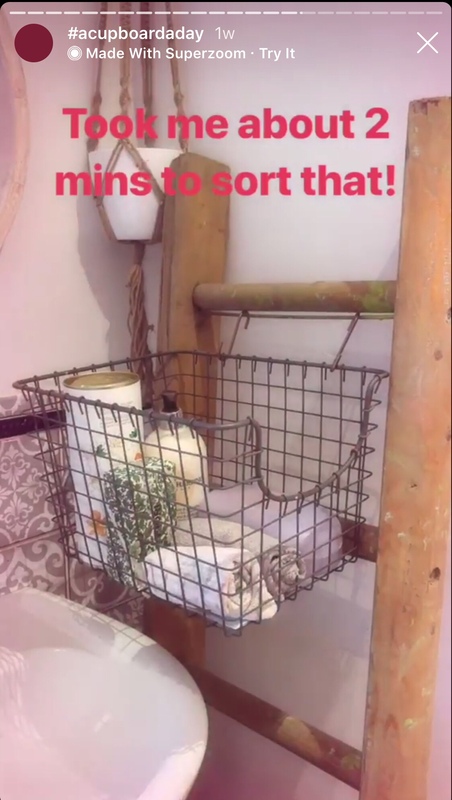 Here’s something I shared on my Instagram stories – decluttering this area took less than 5 minutes. Whilst dinner is in the oven, try de-cluttering one or more of the cupboards or drawers. There is no order to this method, you can start in your bedroom and then go on to the kitchen, it really doesn’t matter, do it in your own order, in your own time and although it’s called #acupboardaday, theoretically by decluttering one cupboard/drawer/space will spur you on to continue on to other areas, time dependant of course. 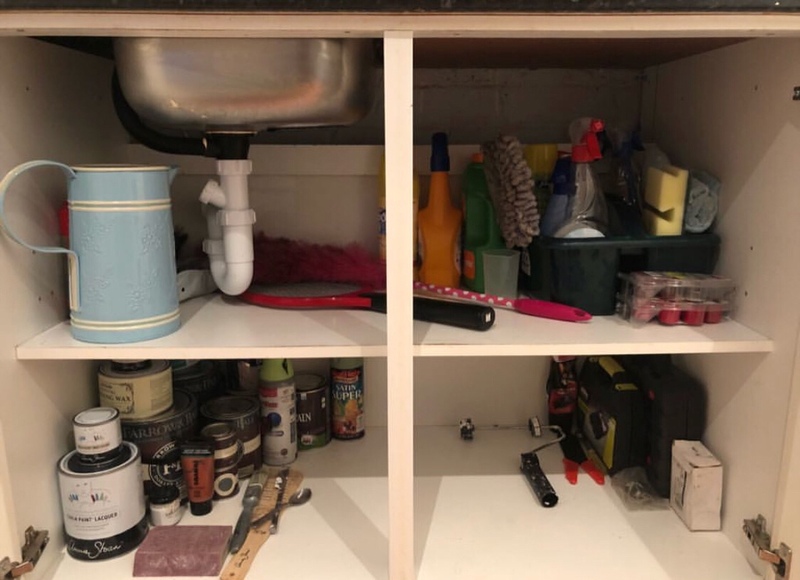 I started with my cupboard under the sink one evening. I could barely fit anything in there as it was packed full of cleaning products, tools, paint and old kettles and toasters. When I sat down and looked through it all, I thought to myself, why the hell have I been harbouring all of this stuff? So I grabbed a bin liner, separated out anything that could be recycled and took it all to the recycling centre. I cannot explain to you the relief I felt on the drive home. 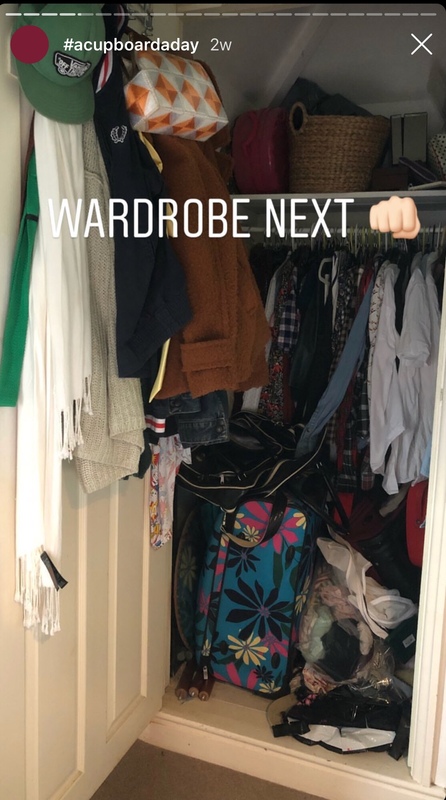 My next challenge was my large clothes cupboard and wardrobe. 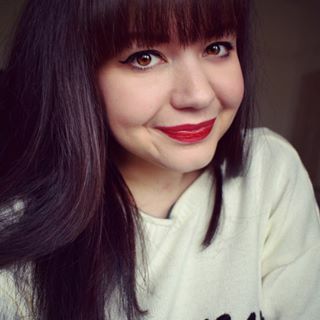 I started by ruthlessly removing anything I didn’t wear, this meant admitting to myself that I probably wasn’t going to be able to squeeze back in to pre baby clothes that i’d been clinging on to for 7 years and even if I could, surely i’d want to celebrate my new figure with a whole new wardrobe right? I divided Spring/Summer clothes from the Autumn/Winter and vacuum packed them away. If you have never vacuum packed, then you need to. Not only does it create space, but it helps you see what you have in a glance, making it easier to get ready in the morning. For items that you are unsure about whether you want to keep or not, I recommend popping them in to a bag or box that isn’t transparent, and revisiting it the next day. If you can’t list anything that’s in the bag/box without opening it, then you won’t miss it if you get rid. 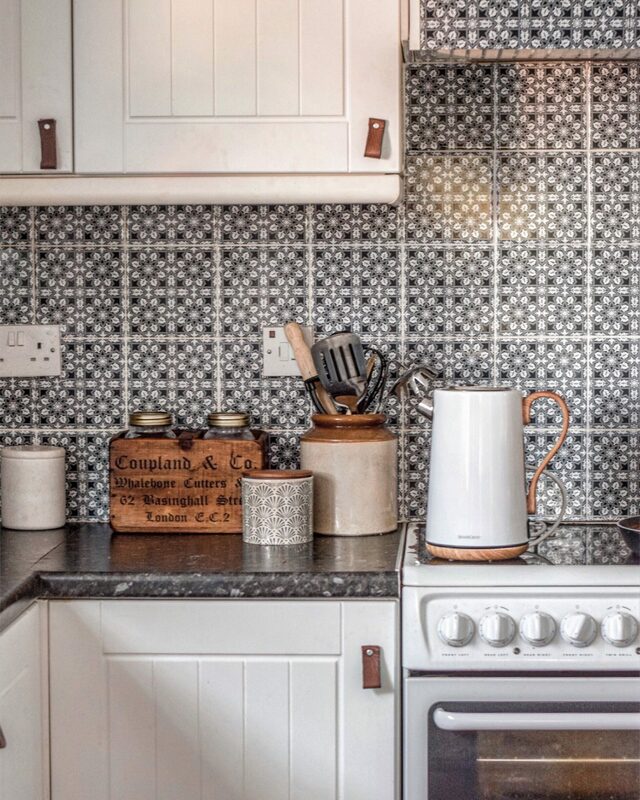 I am slowly but surely working my way through our whole house and I have to say it is so therapeutic, my head feels clearer, and i’m finding it much easier to keep our house tidy, because everything has a place. I have learned that the key to a tidy house, is an organised house. By hoarding loads of things I didn’t need, meant that there wasn’t space for things I did need. If the answer is no, then THROW IT OUT! I’d love for you to join me on this journey, it’s not an overnight method, it’s a realistic and manageable one and it’s proven to have a positive effect on your mental health. If you do want to get involved then please use #acupboardaday on Instagram and tag me @iamhayleystuart too so I can follow you on your journey to a clutter free life. I apologise for the awful photography in this post, most of the images are screenshots of videos from my Instagram stories. I like the premise of a cupboard a day. Makes it feel more manageable doesn’t it. I am a regular declutterer and even then there are times when you wonder what you started when you emptied out a cupboard!